The high profile event is held annually at the One World Observatory to highlight organisations which are successfully using sport to promote and achieve the UN Sustainable Development Goals. ChildFund Pass It Back was also shortlisted for the Best Partnership or Collaboration award. ChildFund Australia’s International Program Director, who accepted the award at the event, said: “This is a program that we are incredibly proud of, and is highly deserving of this award. Not only does ChildFund Pass It Back give marginalised children from poor communities in Asia the opportunity to learn valuable life skills through rugby, but our child safeguarding systems mean we support children’s rights to be protected from all types of physical and emotional harm. ChildFund’s Pass it Back program was set up for children in rural and remote communities of Laos and Vietnam, who face significant challenges around poverty and inequality. 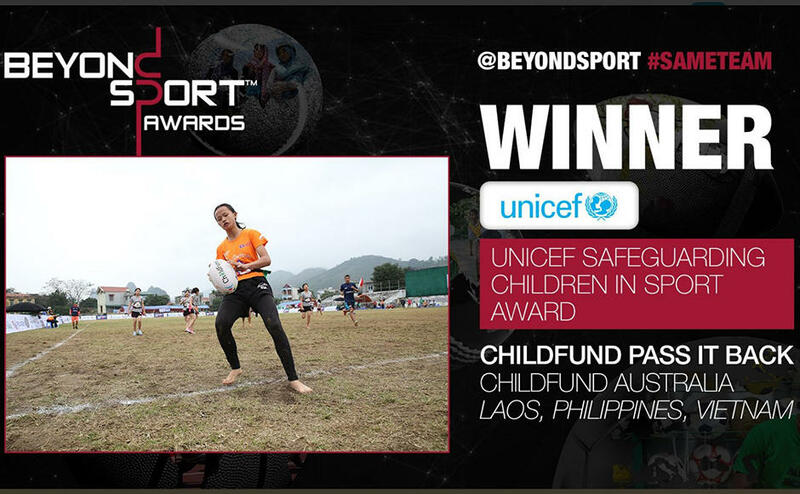 Implemented in partnership with World Rugby, Asia Rugby and Women Win, more than 3,000 children and youth from Laos, the Philippines and Vietnam have benefited from participation in the program with more than half of all players and coaches female.